For Colombia, a country that has a Catholic population of 90%, the week-long celebration of Easter, or “Semana Santa” in Spanish, is the most important religious festival of the year. Easter additionally is a huge economic pull for Colombian tourism. The President of the Colombian Association of Travel and Tourism (ANATO), Paula Cortez, said there is an expected 15% increase in national and international tourism throughout Holy Week. During “Semana Santa,” visitors flock to cultural and religious sites around Colombia to reflect on Jesus Christ, to repent sins and to witness the unique celebrations that occur around the country. The Ministry of Commerce, Industry and Tourism recently launched the campaign, “journey through Colombia, live it with joy”, explaining that there will be 52 safe routes for tourists to explore the country during the Easter period of April 12 to 20. Each route will be protected by the military forces and highway police. The small town of Mompox is widely known as the inspiration of Gabriel Garcia Marquez’s world-renowned magical realism novels. However, during Easter Mompox also plays host to some of the most unique religious celebrations in Colombia. As far back as the 1560s, wealthy people from this small Colombian town would donate clothes, jewelry and paintings to the church as a way of expunging their sins. Nowadays, the Serenade to the Deceased is a formal procession that takes to the streets of Mompox, where town residents dress in their finest clothes, congregating in the cemetery to spend the night among the dead. Candles and flowers are placed around the graves, and music is played throughout the night. Colombia’s capital of Bogota effectively shuts down throughout Holy Week. Shops, restaurants, museums and galleries close; schools and offices send their attendees home. In fact, the only business that boom are of the religious variety, as churches throughout the city open their doors to hundreds, if not thousands, of worshipers a day. A long standing Easter tradition in Bogota is also to visit seven religious monuments or churches. This type of pilgrimage is made by Catholic believers to remember the journey Christ made during his crucifixion. Throughout Holy Week, groups of people take part in these processional journeys around the city. Bogota’s streets are closed down for pedestrian access, and crowds walk from one church to another, taking Mass, receiving blessings and saying prayers. Each church honors Jesus by organizing, decorating and presenting a room to him which is open to the public throughout the day. Visitors will also visit important sites around the area of Bogota. For example, the Salt Cathedral of Zipaquira, 50 km from the capital, which features chapels and a main altar all carved out of salt mine walls. Another important site just outside of Bogota is Monserrate mountain, rising to an altitude of over 10,000 feet. There’s both a cable car and a funicular railway for non-religious tourists to reach the top of the mountain but religious pilgrims choose to climb their way up to the small white church on the mountain’s top, and a shrine devoted to ‘El Señor Caido’ – the Fallen Lord. The shrine receives a daily influx of pilgrims making the journey to pray to the statue of Christ, but there are thousands more during Holy Week. To accommodate for this, the pathway has been renovated this year and opens from 4am to 1pm daily for both worshipers and tourists to walk up the mountain. However, pregnant women, children shorter than 3 feet and people over 75 years old are not permitted to make the ascent. Popayan, located in southern Colombia, hosts one of the biggest Easter festivals in the country and boasts Colombia’s largest concentration of churches per capita, according to Colombia’s official tourist website, ProExport. 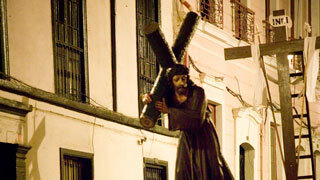 The 400 year old celebrations surrounding Holy Week are now so notorious that in 2009 the event was added to the UNESCO list of Intangible World Heritage Sites. 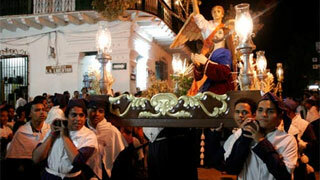 There are three major celebrations that take place in Popayan during Easter week. The first, on Palm Sunday, is a procession where palm leaves are blessed. A night time ceremony on Holy Tuesday follows, where men carry images of Christ from St Augustine church to the city center, and are welcomed by men in red robes who spread incense, chime bells and carry a crucifix. Good Friday’s procession is the most symbolic; representing the moments before the crucifixion of Christ. Death, seen as a skeleton, is carried through the streets, and men walk alongside carrying tools, representing the men who nailed Christ to the cross. The resurrected body is made of ivory and tortoise shell and portrays the resting body of Christ after his descent. 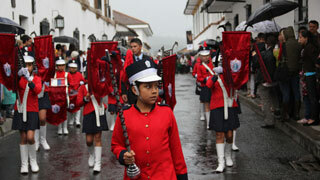 In addition to the processions, Popayan organizes religious music festivals that are held in the colonial churches and feature both Colombian and international musicians. In Ipiales, a town that borders Ecuador, sits one of the most fascinating churches in South America. Built at one end of a bridge that sit above the river Guáitara, the church of Our Lady of Las Lajas is visited throughout the year by tourists and locals alike, but receives many more visitors during Easter week. Families and visitors to the town during Holy Week are party to a ceremonial procession every day of the week, ranging from ceremonial feet washing on Holy Thursday to Good Friday’s two hour night procession with sacred images and Christian symbols through the city’s central streets.